It's a truth universally acknowledged that early 20-somethings are full of wisdom and anxious to share it with their unawakened parents. I've mentioned before that my 21 and 22-year-old girls have enlightened Dave and me on many contemporary topics, including gender nuances, the patriarchy (that's Dave's favorite), and various "social constructs of reality." These are complicated topics and we all five of us plus my mom, our "Nani," have listened and learned but also disputed, counterpointed and exchanged heated opinions too. So the sheer simplicity of Emma's next point of improvement for us came as something of a relief: she shined her young light on our household's consumption of plastics, especially single-use plastics, and their dangers to our ecosystem. 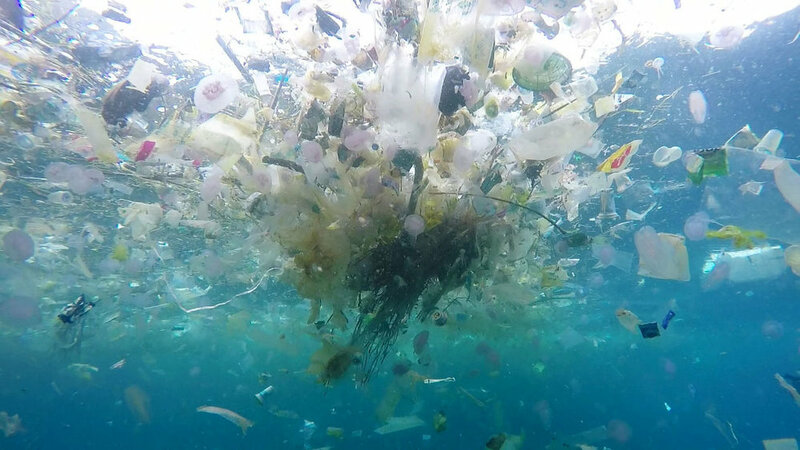 Once she showed me a few images of what the ocean, its sealife and shores look like because of discarded single-use plastic, there was no need for discussion. It was not nuanced nor were there counterpoints. * We've always done the basic double-bin recycling, but we needed to do more (meaning use a lot less). Many of you have told me that Emma is so enjoyable - as in smiley and friendly. Well, I'm here to tell you she's scary when she is righteous, and well - right. When was the last time someone you care about said: "I'm so disappointed in you?" My mom used that phrase when it counted with Patti and Paul and me, and I had to say it at times (not often) to Emma Rose. So you can imagine the impact on us when she got bubbling together in a pot 'til it boiled over: 1) her lifelong love for the planet including saving rainy-day worms since she was a waddley toddler plus watching the "Planet Earth" documentary 1,000 times since she was nine; 2) her biology-major awareness of and concern for the universe; and 3) her sense that her own parents were ruining her earth. Ouch. Emma didn't stop there with her light-shining (did I mention she's a biology/ecology major now?) because in her correct opinion we needed to be more mindful about creating garbage in general that ends up in landfills. We needed to compost (thanks City of Wheaton—my egg shells now go in your organic waste bags**) and just make LESS garbage, including that Daddy needs to use his paper towels 'til they shred. Participate in our Community Kitchen Shower. I bet most of you have matching plates at home and I too really value (I can't help it) a lovely table. So Emma approved my idea of having a PPB shower for ourselves so that our in-store plates and mugs match. If you wish you can contribute to this cause. For cooking demonstrations and everyday use, I selected this lovely bee design, evoking conservation initiatives for our beloved pollinators. If you're interested, please come into the store or click here to gift us some to help our cause along. *I'm no expert, but from my reading, apparently most Americans use an average of 300 single-use plastic bags for about 12 seconds each every year. These things can be slippery and clog up recycling machinery plus they are very difficult to separate and recycle properly as workers struggle to keep up with our many bins. I read that this could result in perhaps as much as 93% of single-use plastics ending up as landfill. As you've no doubt read, both the EU and New York State (joining California) have now severely restricted use and manufacture of single-use plastics; must be lots of Emmas out there. I was particularly inspired that in the EU products will soon come with warnings about the health of the earth if one purchases single-use plastics - much as our cigarettes come with a human health warning.